Get a PayPal Business Account. Described on this page. Get and apply a special "identity token" from the PayPal account. Described on this page. The PayPal Identity Token is use to allow your HotDoodle site to generate PayPal payment forms for your account. The site must be on a Dynamic Hosting plan. Without this token being present in your HotDoodle site PayPal will reject all activities from your site. You do not need the Identify Token if you are using scripts generated by PayPal – the scripts already have the token embedded into them. The token is NOT your PayPal password. HotDoodle and your site do not need your PayPal password. To get the identity token, first get into PayPal's selling tools. Then click on the "Update" link to the right of Website preferences. The "Website Payment Preferences" screen opens. b. The URL is set to the domain of the HotDoodle website. Important! Save this form before proceeding to the next step. If you do not, a required field will not be shown. 8. Reopen the form by clicking on the "Update" link to the right of Website preferences. 9. Scroll down to "Payment Data Transfer" and this time there will be an Identity Token listed below. This is the string of numbers and letters needed in the Hotdoodle PayPal Configuration Screen. 10. Select and copy the PayPal “Identity Token” for use in HotDoodle. 11. Follow the steps below to add the PayPal Identity Token to HotDoodle. This token lets your site identify to PayPal that it is sending payments for your account. 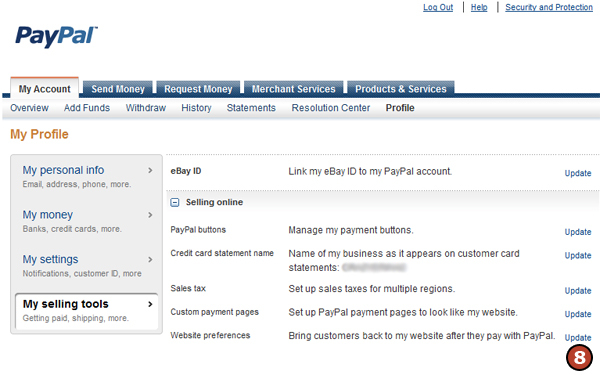 This is not needed if you are using only button scripts generated by PayPal. These scripts will not, however, cause their purchases to be tracked in the HotDoodle website. 3. From the HotDoodle Toolbar click on the "Administration" tab. 4. Click on the "Configure Site" button. 5. Click on "Paypal Details" button. 6. Type in the email address of the Paypal account in the [PayPal Email] field. 7. Paste in the PayPal Identity Token in the [Identity Token] field. 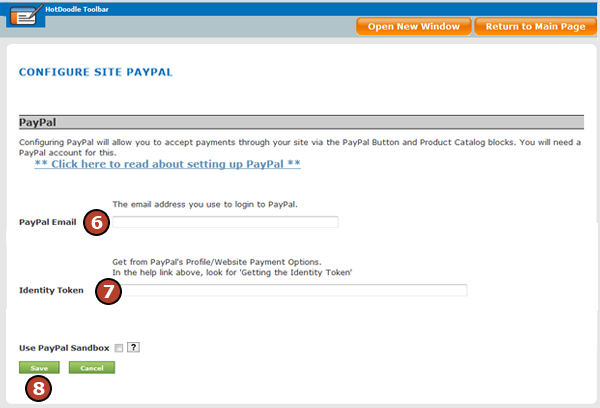 Use the PayPal button generator and copy its scripts into the HotDoodle PayPal block.